Copywriter | Portfolio | Event Scripting . The Telecom Managers Association (TMA) exhibition, which ended in 2002, took place in Brighton every year and was the largest event of its kind in the UK, comparable to ITU Telecom World in Switzerland and CeBIT in Germany. TMA was an opportunity for telecoms companies to showcase themselves and for telecoms buyers to directly compare the services and technologies of dozens of suppliers under one roof. TMA exhibition stands took a large bite of out each year's marketing budget, so it was important to maximise the return on investment by presenting company information that would win new business. TMA was typically attended by knowledgeable telecoms buyers of a middle and senior level, as well as CEOs and company directors. Copy and presentation had to be of a level technical enough to engage and interest the actual people who would be buying and implementing telecoms services. It also had to showcase the company in a way prestigious enough to satisfy upper management. I prepared ten video scripts, all of around 5 minutes, introducing my company's services. 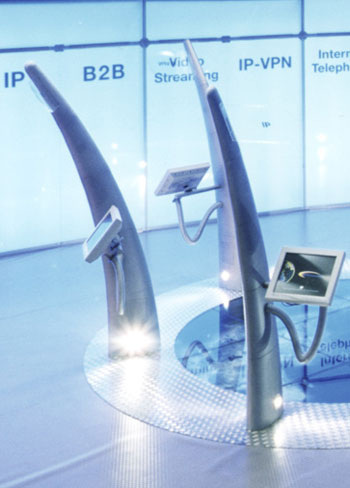 The scripts could be seen and heard by interacting with a series of touch screens (pictured). It's always difficult to pinpoint exactly what tips the balance in a customer's mind and wins you the order, but sales colleagues later thanked me for my work on TMA. The stand -- which I project managed -- and its marketing copy made a real difference to their work and helped them win a number of long-term clients, more than justifying the expense of the exhibition.